Estimates of the prevalence of psoriatic arthritis among individuals with skin psoriasis have varied in the literature from between 2% to more than 40%, depending on the method of ascertainment and case definition used to define psoriatic arthritis. Here, Ibrahim et al (Arthritis Care & Research 2009; 61(10): 1373) report a study of psoriatic arthritis among individuals with psoriasis, using examination and validated classification criteria for psoriatic arthritis. Three community-based administrative databases in the U.K. were queried for individuals with psoriasis. Those identified were mailed a standardized questionnaire of psoriatic arthritis signs and symptoms. 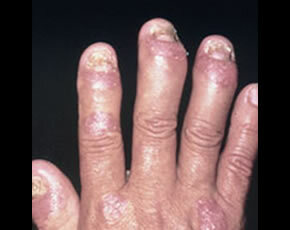 A approximately 50% sample of the respondents was brought in for an examination, in which history and/or physical findings of skin psoriasis were confirmed, and a diagnosis of psoriatic arthritis was confirmed or refuted based on the validated CASPAR diagnostic criteria for psoriatic arthritis. Among 22,500 database patients, 633 were identified as having an administrative code for psoriasis (2.8% of the total population). Of these, 168 returned mailed questionnaires (27%), and 93 (55% of the respondents) were evaluated in clinic. Of those evaluated in clinic, 12 met diagnostic criteria for psoriatic arthritis. Four of these had known psoriatic arthritis and 8 were new diagnoses. Of the remaining 81 that underwent exams, two had no history of psoriasis and did not have psoriatic arthritis, 26 were diagnosed with osteoarthritis, 15 with mechanical low back pain, 12 with unclassified polyarthralgia, 3 with joint hypermobility, and one each with rheumatoid arthritis, gout, fibromyalgia, and Raynaud’s. After correcting for true-negative and false-positive rates, and extrapolating the data from the subgroup to the entire hypothetical cohort, the estimated prevalence of psoriatic arthritis among those with psoriasis was 11.7%. Using verification with examination and a validated case definition, approximately 1 in 10 individuals with psoriasis have psoriatic arthritis. Defining the prevalence of psoriatic arthritis in psoriasis is potentially important for defining disease associated risk among psoriasis patients. However, prevalence estimates from studies have yielded widely conflicting results. This study, incorporating a standard case definition and examination, is of higher quality than many previous studies. In particular, these data demonstrate that other forms of non-inflammatory joint pain (i.e. osteoarthritis, mechanical low back pain) are actually more prevalent among those with psoriasis than true psoriatic arthritis. While the prevalence estimate of 12% identified here is probably a reasonable estimate of the true prevalence, the prevalence of moderate to severe psoriatic arthritis (i.e. requiring specific immunomodulating therapy above that given for skin psoriasis) is most definitely a much smaller figure.